As many of these Chips were a little on the small size, the joy of biting into a full on giant Chip was not available to us. The Chips did however feature a variably crunch level. Some seemed a little softer than others, but some were very firm and rigid; providing a hard snappy crunch. These Chips were somewhat lighter colored than some. Healthy looking Baked Potato skin was visible on many Chip edges. There were quite a lot of small Chips in the bag. The irregularly shaped Chips had some oily areas that had soaked up whatever seasoning there was, but there was still room for some small green and dark flecks here and there. 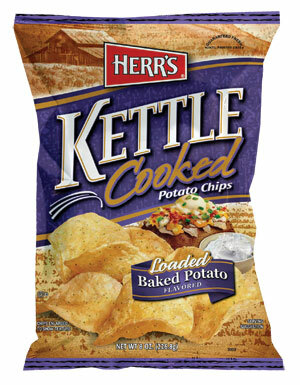 Like many of Herr's flavors, salt and potato are dominant flavors that emerge as you chomp through a bag of their Kettle Chips. These were a little creamy, maybe a little cheesy. There was certainly a hint of fresh herbs. A nice, but relatively tame and inoffensive flavor, with no popping tastes that stood out. This was however a good thing - we found it a really tasty Chip that was perhaps more enjoyable because of the underlying flavors rather than full on, evident flavors.